Ahh so this is the last day for this and sorry i missed the other days had some fraternity stuff going on! The single most amazing fireworks ever. Yes its pry cause i love the disney villans and cause i love the haunted mansion and cause i love halloween but stil it is simply amazing the colors and the music its great and a must do for anyone who has never seen it. 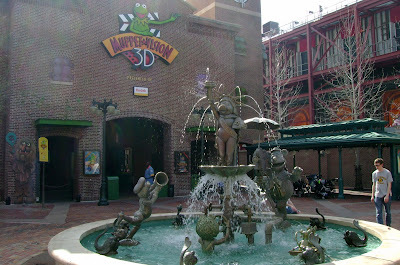 Yes i love the muppets they are awesome i dont know why its is this fountain i think its just its muppets and there is a little hidden mickey float on it. Ok so thats it for the 30 day challenge. I heard there is another one out there so i might do that one considering i have i think 58 days left like i check in and about 50ish til i actually go down there. Ive been thinking about other stuff to do in the orlando area and i have alot but if anyone knnows anything that is a must do please leave a comment or email me ooo ya also everybody we need to make this a little more interactive so feel free to leave comments and have discussions!!! Ok so til next time everyone have fun!